Simply Pam: Warmest Winter Wishes and a Giveaway! When I got the My Pink Stamper Winter Punnies stamp set I couldn't wait to use it. It has the cutest saying for Winter. Now, I'm not really ready for winter but I don't mind making winter cards. :) I love how this card turned out. Doesn't it just look cozy? I love the colors in it. So I have a giveaway for this post. I'm doing this because I am over 250 subscribers. I've been over it for a while but keep forgetting to do a giveaway. 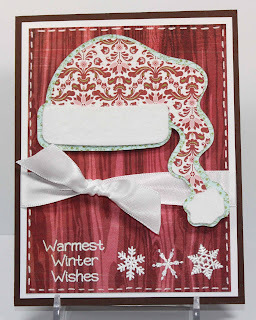 So I thought since I'm showcasing the My Pink Stamper new stamp set Winter Punnies I'd give away one of her stamp sets. This is one of my favorites: Family & Friends. 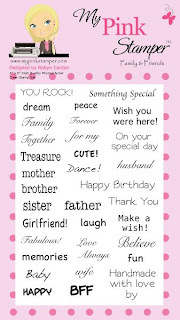 My favorite Happy Birthday and Thank You stamp sentiment is on this stamp set. I use it ALL THE TIME. :) It's in my favorite font too. To win this stamp set please leave a comment on this post, with a way to get in contact with you, and be a follower of my blog. You have until Friday the 3rd, midnight MST, to enter. I'll announce the winner on Saturday the 4th. This is such a great card! I love how you used the pattern on the hat! I absolutely love the background paper; and the patterned paper on the hat is just perfect!!! Such a cute card, TFS!!! Sweet card. I'ts hard for me to make winter card right now too. I'm getting some Autumn cards done and sent out. I'd love to win a set of Pink Stamper Stamps...awsome. I love all of Robyns stamp sets. I hope I win. Great card and love the paper. sorry I forgot my contact info. Beautiful winter card! Love the colurs and the details you add for the fianl special touch, that makes your cards so nice. I love the deail on the inside of your beautiful winter card. Congrats on your milestone. Thanks for letting us join in the celebrations. I love your winter card. So pretty! Thanks for the chance to win MPS stamps. Great card. I would love to win the stamps. Congrats on 250! I love your card! The flocking on the hat was the perfect touch! Congrats on the 250 followers.I love your card it is so beautiful. I so want all the pink stamper stamps,thanks for the chance to win. Great card hon. Thanks for a chance to win some Robyn stamps. I don't have any yet!! Love your card! Love the colors. I really like how you embossed the snowflakes and sentiment! What a fun give away. Congrats for 250+ followers. What a cute card. I love the paper you used for the Santa hat!. I'm SO happy that you have more than 250 followers!!!! You deserve it, your cards are AMAZING! Also thanks for all of your sweet comments on my blog too. I'm glad that we a papercrafting friends :). This card turned out awesome. I love the paper, the sentiment and of course the fun flock. me at glorajean dot com. Congrats to you on having 250 followers. I love the Santa hat. Love the card. Congrats on reaching 250 followers. Love your projects. Awesome card!!! Love the colors. Thanks for the chance to win. what a super super nice card. Hope I'm the lucky winner. I've been wanting this set for a while. Great card. I have this cart but haven't used it very much. Thanks for the inspiration. I am a follower. I love your card! I love following your blog you have such great ideas!!!! Thank you for the chance to win. Mark. Luv to add mps set to my collection. Thanks again. Love this card!! It really does feel cozy! Congrats on 250! Your card is so cute! I would LOVE to win MPS stamps! Thanks for the chance! Love your winter card. So cute. Great giveaway. This is one I don't have yet. Thanks for the chance to win. Love your card. I love all the details you added! Congratulations on over 280 followers! I love the papers you used on this lovely card! Thank you for giving us the chance to win the MPS Family & Friends set! Your card is great! Love the pattern paper and congrats on your massive following. You deserve it. Thanks for the opportunity to win. Love the card. Love Robyn's stamps too. This card is beautiful! I'd love to have some of the MPS stamps. Thanks for the chance to win.